I love jewelry. I've been collecting it for many years now. Not much of it is worth anything--it's mostly from Forever 21 and Target and Charming Charlie's. 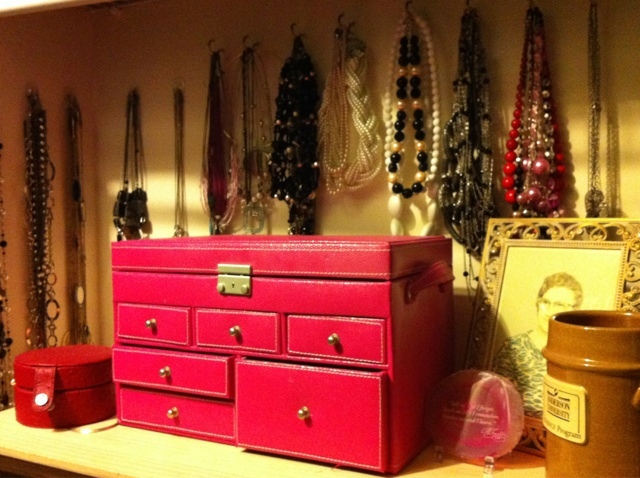 But I have a big ol' jewelry box full of it, plus a ton of necklaces I have hanging on hooks in the wall of my closet. I have each drawer of earrings categorized by style and color. And all the bracelets are together in the biggest drawer, with all the rings in the top. The shelf it's on also holds a few items I love--a picture of my Nannie, my mug from college, a little plaque my mother-in-law got me, and the travel jewelry box that was a gift from a dear friend. What a nice place to get ready!